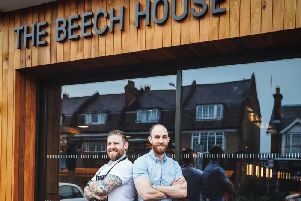 Berkhamsted’s award-winning High Street is teeming with restaurants and bars and sometimes it’s hard to see the wood for the trees. The name and brand of Pizza Express is well known and established but sitting at the near end of the High Street, you’d could be forgiven for missing the quaint restaurant. But you will find an intimate, cosy atmosphere awaits you especially since a recent revamp with new features including pendant lights, painted decorations and timber cladding and flooring throughout. The restaurant’s popularity has not waned with it’s ever increasing network and while it may be yet another chain - and yes the High Street does need to maintain its tradition of having some great independents - it really doesn’t feel like a chain and in many respects has local at its heart. The staff offer as warm a welcome as the pizza oven while the menus - with the spring/summer offering having just been launched - cater for all ages and there is genuinely something for all tastes. Cod Crocchette is a new spring special with creamy smoked cod and mozzarella given a red jalapeno kick, baked in the ovens until golden brown. Also new to the menu is the Risotto Primavera, a creamy risotto with asparagus, white wine, garlic and Gran Milano cheese, finished with parsley. There is a great vegetarian and gluten free offering too but of course Pizza Express wouldn’t be Pizza Express without the pizzas. The Zapparoli Romana pizza is topped with chicken, hot soft ‘nduja sausage, mozzarella, garlic oil and Gran Milano cheese on smoky, creamed corn finished with red Roquito pearls and parsley and is a real winner. There is also the Seafood Rigatoni, another spring special, of salmon, pollock and king prawns in a creamy white wine & garlic sauce, with rigatoni pasta, lemon and parsley. A great drinks selection coupled with friendly, quick service and that benchmark Pizza Express value for money food is a great addition to any high street. People might ask does Berkhamsted really need so many chains? Maybe not, but it definitely needs it’s Pizza Express.